Freshen your home with this beautiful Cloudberry crocheted blanket. Place one on the sofa or in the bedroom for an instant cozy accent! In fact, this pattern is an ideal project for intermediate crocheters to work on. Once finished, the crocheted lapghan should measure approximately 34 inches from tip to tip and around 29.5 inches from side to side. 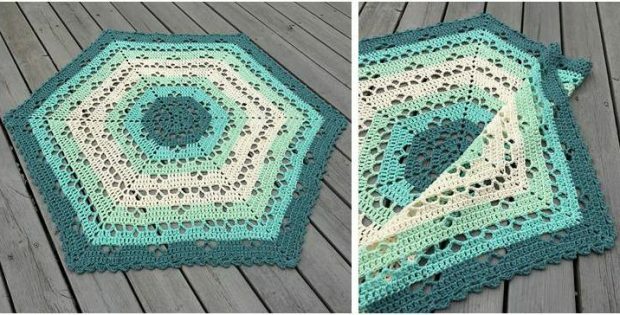 In metric measurements, the completed crocheted hexagon blanket should have a width of about 85 cm between two tips and roughly 75 cm between to sides. This crochet pattern is a wonderful design by Johanna Lindahl. In fact, you can access the FREE pattern for this colorful crocheted throw from the Mijo Crochet website. The pattern contains instructions in both English and Swedish. English directions are found below the Swedish ones. Featured image: Mijo Crochet – thank you!